Politics isn't my forte, but I have written a few thousand words on the topic, and I will undoubtedly write more when the urge strikes again . . . usually around election time. You can read some of my thoughts on the topic here and here. Paul Combs takes a shot at politics once in a while too, but he does it with deadly accuracy in the form of artwork. Click here for his latest masterpiece. They aren't kidding when they say a picture is worth a thousand words. Click here to see a gallery of his artwork, and here to visit his web site. Speaking of words, my next Spontaneous Combustion column will appear in the February issue of Firefighting in Canada, instead of the January issue of Canadian Fire and EMS. You may not care, but I did on October 31st, which was the day the switch was made . . . and which also happened to be two days before the deadline for the January column. I am usually at least mildly panicked when I feel the hot breath of a deadline on the back of my neck, especially if my mind is still as blank as the computer screen, but this time I was strangely calm. I had an irrational feeling that a thousand words would magically find their way into a semi-orderly arrangement on my screen within 48 hours, no problem. It may have been delusional, but it was at least peaceful delusion. So when editor Laura King emailed a suggestion that the column be run in the February issue of FFIC - with a writers' deadline of December 6 instead of November 2 - I decided it must be Karma. Or perhaps Laura was a mind reader and knew I was helplessly stuck in literary lala land. Or maybe it was just a happy coincidence. Regardless, the switch gave me breathing room to corral my recalcitrant thoughts into a semblance of order, and the February column looks more promising by the day. The birthing of a new article always amazes me a little. A week ago it didn't exist. A few days ago, it looked like someone fired a dictionary out of a shotgun . . . words and phrases splattered across an MS Word document like graffiti on a boxcar, only less artistically. A few hours of cut, paste, delete and rewrite (which I affectionately call "slash and burn"), and it's almost ready to launch. Saying it "just happened" would be like saying the stork brings babies, but I'm still not sure I understand the biology of writing. One thing for sure, writing, like most things including firefighting (and babies), starts with passion. Speaking of passion, I saw this as I left my parents' place today. 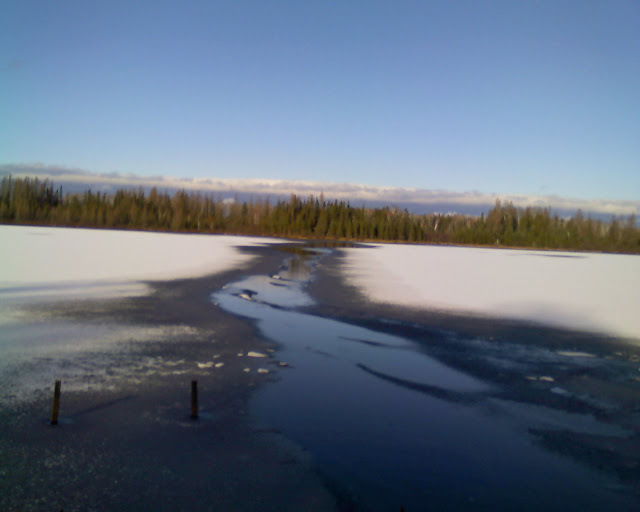 It's a path of water across the frozen lake by their house. My 86 year old father is a passionate fisherman, and when he saw a patch of open water on the other side of the lake, he had to break across in his 17 foot canoe for one last fling before winter. There's passion, and then there's fanaticism. To finish off with something at least partly connected to firefighting, Intel Labs has produced a ball-shaped electronic gizmo that can be rolled into a burning structure to take readings of important data like temperature, oxygen levels, and chemical levels, then send them to a smart phone so firefighters can know what they are getting into before they enter. Click here for an article and short video on the "fire ball." You can read my musings on other gizmos here. The great thing about blogging is that you are allowed to write like you fired a dictionary out of a shotgun.